When we consider a getaway or a vacation we want to go to a unique place, that is different from the usual day to day, that surprises, right ?. Well, you've found it! 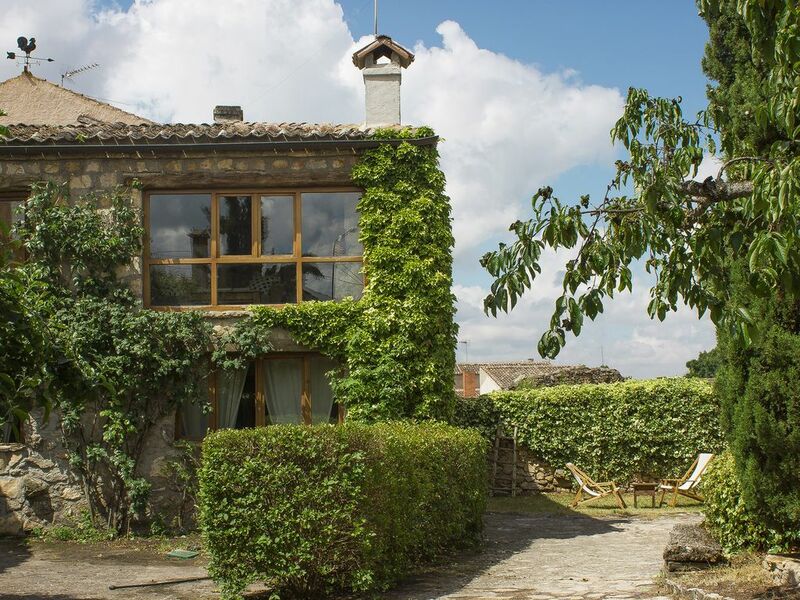 We present Casa Sanchopedro, which, in reality, is not one, but two spectacular houses in the same area, with a wonderful garden and with capacity for 10 people. It is in the town of the same name, Sanchopedro, in a unique enclave, surrounded by nature, both outside and inside the enclosure, so it is a real weekend or holiday pleasure. But, in addition to the surroundings, it is very well located, at 15 min. from Pedraza, 20 min. of Riaza, near the Hoces del Duratón and in the skirt of the Guadarrama National Park. As soon as you enter through the door of either of the two houses you will be surprised by its decoration, which may be the envy of any Instagram deco account, taken care of down to the last detail and designed to make the stay pleasant and comfortable. Each house has 2 floors. In one of them, on the ground floor is the kitchen, which is fully equipped and with a pantry, but without losing that rustic and authentic touch, which is the unmistakable hallmark of this house. And, of course, the great protagonist, the living room, divided into several spaces, with a large dining table, and two fireplaces. A spacious room, with many details and where the whole family or all friends can meet. And already on the top floor are the two bedrooms, one with king-size double bed and bathroom and the other with 2 single beds and bathroom outside the room. But the other house also holds some surprises, like the game room, with a pool table, on the floor below. In addition, also downstairs there is a room with 2 single beds and bathroom included. And, upstairs, there are the other 2 rooms, with 2 single beds each and a bathroom, but also a living room with fireplace and a large window from where to see the garden, for example in winter, while reading to the heat of the home. Surely you've been wanting to meet her, whether it's for her garden, for billiards, for the chimneys, for the decoration or for the spacious rooms. For one thing or another it is worth it, you will not regret it! It is ideal to go with family or friends and isolate a few days from the rest of the world, enjoying every corner of the house. At Christmas, Easter and bridges the minimum rent is 3 nights. Check the availability and conditions of the crib.